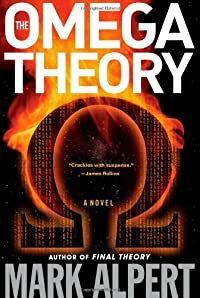 The Omega Theory by Mark Alpert, a Mysterious Review. Review: Mark Alpert blends science fact with science fiction — the lines are very blurred — in a quest to stop the total destruction of the planet, maybe even the universe, in The Omega Theory, the second thriller to feature historian Davis Swift and quantum physicist Monique Reynolds. Michael Gupta, the autistic teenaged adopted son of David and Monique, is kidnapped from his behavioral therapy session in Manhattan. The great-grandson of Albert Einstein, Michael has memorized one of the physicist's prominent, though unpublished, discoveries, the "unified field theory", that which explains the relationship between all known forces. A group of "True Believers", radicals who posit that the only way to cleanse the universe of the evil on the planet is to destroy it, are responsible for taking Michael. Coincidentally — or not? — at the same time of Michael's abduction, Iran sets of a nuclear device that observers say has altered the very state of the universe. David and Monique team up with FBI agent Lucille Parker, and set off to the Middle East to find their son … but also to prevent the ultimate destruction of the earth. Readers are taken on a wild ride here, and will likely feel rewarded by the journey. The action starts almost at once and doesn't let up, encompassing the disparate (or maybe not so much so) worlds of science, religion and politics — past, present, and immediate future. The beliefs that drive men and women, both good and evil, to achieve their goals, at any cost, are also what propel the plot forward. The characters are somewhat thinly developed, more superficial than substantive, and David and Monique's actions and reactions with respect to the kidnapping of their child don't always ring true, but The Omega Theory is first and foremost a dynamic, driven action thriller, one that delivers on its premise. Special thanks to guest reviewer Betty of The Betz Review for contributing her review of The Omega Theory. Acknowledgment: Touchstone provided a copy of The Omega Theory for this review.